At St. Thomas Aquinas, we want to keep our children safe. Part of our way of keeping them safe is requiring all volunteers who work with children to participate in VIRTUS training and complete other VIRTUS tasks before volunteering. Volunteers are required to complete a three-hour VIRTUS training session which will better equip them to protect children under eighteen years of age. This training helps volunteers understand the signs of sexual abuse, as well as the methods and means by which offenders commit abuse. Volunteers are also required to complete some online training, such as the Mandatory Reporting Training and Code of Conduct Training, and they also must sign the online Code of Conduct and 123B Form, which is a form that enables us to run a background check. There are numerous things for volunteers to do, but it is all to ensure the continued safety of our children. The aforementioned documents and training (besides the three-hour VIRTUS training session) can be completed through http://www.virtusonline.org/virtus/. 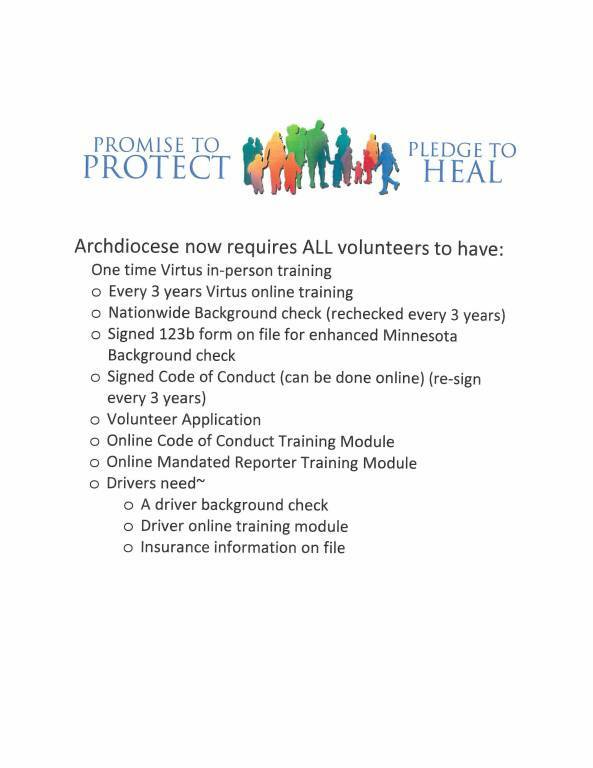 All of our current volunteers who were trained prior to July 1, 2014, are required to update their safe environment compliance at http://www.virtusonline.org/virtus/. Child sexual abuse is a widespread societal problem, not a Catholic clergy problem. The more people who are trained to recognize the warning signs of an offender, the safer our children are. In the aftermath of the clergy scandal, the Charter for the Protection of Children and Young People requires the Church to train both adults and children to prevent child sexual abuse. This is not because the Church thinks all adults are the problem. It is because the solution to preventing child sexual abuse depends on caring adults knowing what to do (USCCB). Here is a link to the FAQ page of the United States Conference of Catholic Bishops (USCCB). If you have forgotten the User ID for your VIRTUS account, call Nicole Rogers or Deone Parnell in the parish office (651-459-2131).